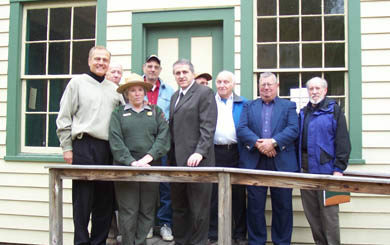 UDC Announces Honorees for Awards Ceremony on April 28 - Upper Delaware Council, Inc.
Photo: New York State Senator John J. Bonacic (pictured at far left) came to the Cochecton Train Station to make a series of grant announcements on October 24, 2006. NARROWSBURG – The Upper Delaware Council, Inc. (UDC) will honor those who have enhanced the quality of life or protected the resources of the Upper Delaware River Valley at its 31st Annual Awards Ceremony on Sunday, April 28. Reservations at $28 per person are due by April 19 for the public event that will take place at Central House Family Resort, 81 Milanville Road, Beach Lake, PA. The keynote address will be delivered by U.S. Congressman Matt Cartwright (PA-8). A reception with a cash bar begins at 3 p.m., followed by a buffet dinner at 4 p.m. Representative Cartwright will speak at approximately 5 p.m. Distinguished Service Award – John J. Bonacic, retired New York State Senator for the 42nd District, for his advocacy on behalf of the Upper Delaware River Valley during a 20-year tenure in the Senate of his 44-year public service career. Robin M. Daniels Memorial Lifesaving Award – New York State Department of Environmental Conservation (DEC) Forest Ranger Richard “Rick” Franke (Region 3, Zone B, Livingston Manor), for the August 4, 2018 high-water rescues of multiple individuals in peril during his first-ever joint patrol with the National Park Service on the Upper Delaware Scenic and Recreational River. Partnership Award – Kris Gilbert & Danielle Besso of the New York State Department of Transportation, Region 9, for initiating, designing, and implementing a package of new points of interest and directional signage along and off the New York State Route 97 Upper Delaware Scenic Byway and the Upper Delaware Scenic and Recreational River unit of the National Parks System. Outstanding Community Achievement Award – Wayne County Commissioners (Brian Smith, Wendell Kay and Joseph Adams) of Wayne County, PA for their efforts to save the historic Hankins Pond Dam D&H Canal feeder in Mount Pleasant Township from demolition. Cultural Achievement Award – Forrest W. “Frosty” Myers of Damascus, PA, for his internationally-renowned career as a sculptor and artist, the 2018 premiere of the prize-winning documentary “The Art & Times of Frosty Myers” at the Big Eddy Film Festival, his outdoor public gallery at the Wild Turkey Sculpture Park, and the development of a museum for his works in Damascus. Recreation Achievement Award – Pam Reinhardt of the Upper Delaware Chapter, Trout Unlimited, for coordinating the organization’s “Trout in the Classroom” youth and educator engagement program for 11 years. Volunteer Award – Steven Schwartz of Equinunk, PA, for serving as volunteer coordinator of the Upper Delaware BioBlitz events since their inception and his environmental activism in the Upper Delaware River Valley region. Community Service Award – Town of Tusten Councilwoman Brandi Merolla, for her accomplishments as chairperson of the Tusten Energy Committee including 2018 Climate Smart Community designation for the town. Special Recognition Award – Larry D. Neal, Jr. of Beach Lake, PA, for his 28-year career with the National Park Service leading up to his Dec. 31, 2018 retirement as Chief Ranger for the Law Enforcement Division. Oaken Gavel Award – Aaron I. Robinson, representative of Shohola Township, PA, for his leadership and service as Upper Delaware Council chairperson in 2018. All are welcome to attend, with advance payment requested by April 19. A downloadable reservation form is available at www.upperdelawarecouncil.org or contact the UDC at P.O. Box 192, 211 Bridge St., Narrowsburg, NY 12764; phone (845) 252-3022; e-mail info@upperdelawarecouncil.org.